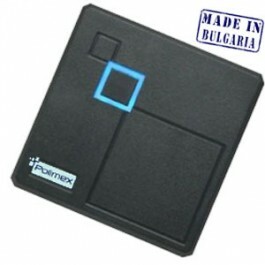 SmartCryptoMaster is a proximity high-tech desktop master reader developed by Polimex Holding Ltd. Its purpose is to create single or series of SmartCrypto devices which can work together (protected with the same unique code). The device uses standard USB cable for communication which makes it suitable for laptop, desktop and tablet without using any additional cables or hardware. SmartCryptoMaster is a specialized high-tech desktop reader which works in read and write mode. Its primary application is to generate unique codes by which you protect your SmartCrypto devices and RFID cards. It gives you the ability to make global control and management of systems with prepaid services. Also SmartCryptoMaster can load credit(impulses) into SmartCryptoUSB which in turn allocate them to the user cards. Other very important function is that the USB reader can create a RFID card with setup function. When using this card you have the ability to change SmartCryptoCredit and SmartCryptoReader's input and output setting or change reader's mode. the manufacturer can not produce devices with your secret protection code. SmartCryptoMaster is a reader-programmer which is the main and most important part of SmartCrypto systems. It is used mostly for global management of paid services or for creating high security systems. For example paid services in fitness and spa centers, hotels, game rooms, vending machines and for security in banking sector, classified information room and others.